We all have pain in our lives. It is hard-wired in. It is not based on or grounded in, but is surely linked to, our external circumstances, both past and present. It is, in the end, a gift through which we find our way to true "joy, peace, and freedom." When we pretend we don't have any pain, either because we perceive that it is not allowed or appreciated or helpful, or because we are striving to look superior or unaffected by life, or because we feel we have some "need to" appear "just fine," we often make fools of ourselves, because it is certainly not the human condition to be "just fine," unless, of course, it is referring to the old acronym, F###ed-up, Insecure, Neurotic, and Emotional. Yes, we are all, under varying levels of masks and costumes, that kind of "just fine." And when we think we have "more than our fair share" of pain, we eventually find out that that is also not true. We all have our equal human share, regardless of circumstances, and equally regardless of circumstances we tend to be either in agony (whether consciously or not) or transcendent (which only happens consciously) - one or the other. Why would we ever try to hide something so natural and so perfectly our own? Well, this is probably because we "learned to" in a society that is so thoroughly pain-averse, pain-avoiding, pain-condemning, pain-covering-up, pain-escaping, pain-killing, pain-managing, pain-medicating, etc., etc., etc.. But pain is not our enemy; our own resistance to it is. By resisting it, it persists, and it feels like such a PAIN!!! !, instead of what it usually is, a signal to our senses that something different than what is is now being called for or invited. We sure have a tendency to blow things just a little out of proportion, turning minor inconvenience or nuisance into WORST NIGHTMARE!!! !, until it really becomes that. We have learned this art after decades of practice as children and young adults. I retook a training last weekend that I have considered pivotal in my growth. In 1982 the course was called Life Training. From that experience I literally started living fully. I learned tools in the training to help me tell the truth and see from a clearer perspective. To live life unencumbered by my conditioned mind. What I also discovered was that if one does not use the tools it is like going back to sleep again. Not the way I was before the "Life Training" but certainly dozing in areas of my life. 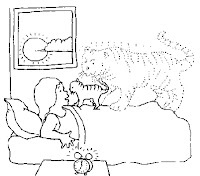 The training is now called "More To Life" and believe me it was worth the investment in time and money to be able to once more see that it is not the tiger in the night to be feared but the kitten on the bed to be loved in the light of day (clear mind) It is all a matter of perspective and choice. I am choosing to use those precious tools daily. For More information follow this link to More to Life.